The art of great storytelling is learned. Great stories leave the reader enthralled as they pass across knowledge and life lessons. 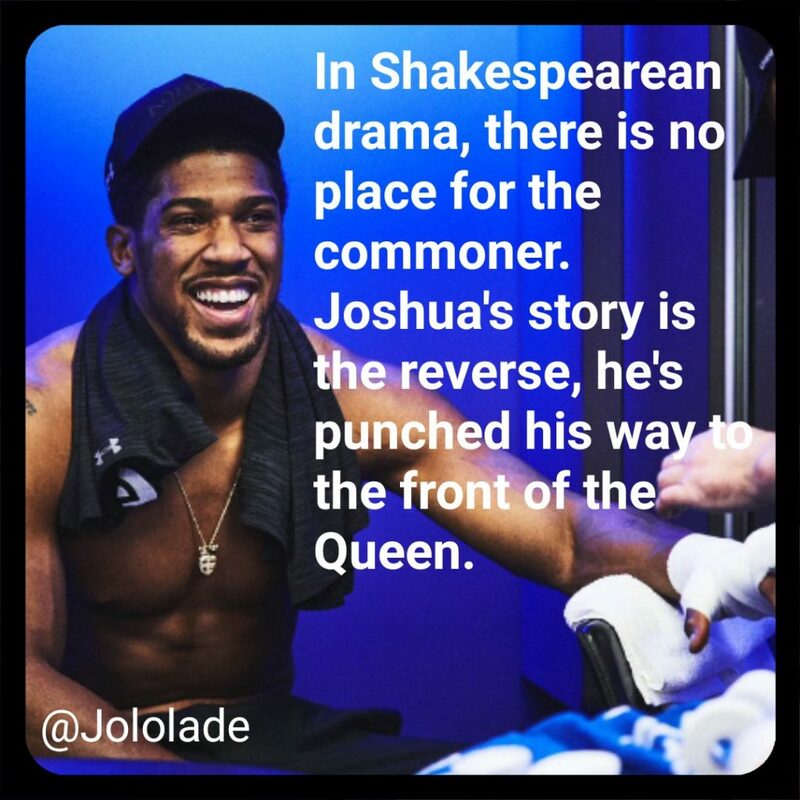 The story of Anthony Joshua is still being written and it has the potential to become a great one. Generations from now, it could become a nighttime story for kids gathered under the digital village moon with a bearded storyteller regaling each arc of his eventful life and how his power-packed punches left opponents gassed out inside the square ring. However, let us not get too far ahead of ourselves. While future generations could see Joshua’s story as a fairytale, the decision of Globacom to partner with the unified heavyweight champion of the world as a brand ambassador is a story worth scrutinizing. Glo’s new television commercial that broke in late March follows on the heels of the first advert that was released in early February. While the first one unveiled the partnership and set a tone for future collaborations between two brands that have gone through the proverbial school of hard knocks to achieve immense success, this new TVC goes further. In the first spot, Joshua announces his “proudly Naija” story of resilience and strength in the face of life’s many troubles, just like Globacom that triumphed across many corporate and political landmines to become a big player in Africa’s telecommunications industry. If anything, that first ad saw Joshua establish his Nigerian roots. He seemed to say, “Hey hold up, I am one of you and I deserve a seat at this table. I deserve to be heard as a Naija man.” Unlike T’Challa’s cousin and adversary Prince N’Jadaka, Joshua did not try to usurp the balance of things, he just told us that though he was born in the United Kingdom and has reached his biggest achievements flying the Union Jack, he is still as Nigerian as we are in his heart and it is a mark that he wears proudly on his sleeves. You cannot deny a man his heritage, AJ is a proud son of the soil, he even likes his eba and egusi soup better than fish and chips. This is some privileged knowledge for those of us that consume his Instagram stories. In this new TVC, Joshua and Glo, having done the establishing shot, go ahead to place the boxer in a firm place in our minds – as a figure that one can aspire to be. Great heroes in the Shakespearean age were born of nobility. It was believed that the only stories worth being told were those of rich nobles who attained fame but were cut down due to a tragic flaw. There was not a place for the commoner to tell their story. Joshua’s story is the reverse. Here is a young man who was born in Watford, became a bricklayer and found that his fists packed a good punch as he worked his way to the top of the heavyweight division. He’s punched himself to the front of the Queen. As simple and straightforward as that might be, Joshua wants us to learn that, unlike the noblesse, he did not achieve his fame and money through inheritance. He has had to work hard for everything he has received and has passed through the flames to become boxing’s golden boy. In this, he is a good example to many young Nigerians who are struggling to find their voice in a world of abundant data where leading Instagrammers and YouTubers want to prescribe quick fixes to life on the glamour lane. In a society where nothing is given, where SARS bother young men and young women are asked for their body before getting jobs. “You don’t stay down, you’ve got to fight. You have to dig deep to be a world champion,” says Joshua. You have to put in the work when nobody is there so that you can have a great victory in front of the world. It is a message that rings true for the UNILAG student, the fishermen on the Lagos lagoon, the tailor in Aba and the basketballers in Port Harcourt as well as for the young boxer in Sokoto. National coverage, fast speed and the best value proposition. As the internet continues to grow and broadband data becomes less expensive, young Nigerians continue to turn to the web for information and inspiration. According to the 2019 Global State of Digital report by Hootsuite, almost a 100million Nigerians are now actively subscribed to the internet. For those of us that are subscribed to Joshua’s YouTube channel, his weekly content offers great insight into his life and backstory. The 29-year-old is currently preparing for his June 1 fight against Jarrell “Big Baby” Miller at the Madison Square Garden in New York. It will be his first fight outside of the United Kingdom as he makes a US bow. Joshua’s careful management of his media and image through the curation of digital content shows an athlete that is in tune with his era. He understands what many young boxing fans want. He provides us with an insight into his life and work ethic. And he succeeds in demystifying the preparations that lead up to professional prize fights. His digital savvy contributed to his being named SportsPro’s Most Marketable Athlete of 2017. In its own market, Globacom has come to be known as the grandmasters of data by providing affordable 4G access to millions of young people across the continent that makes it easy to access the internet and consume diverse digital content. Glo has promised to continue to invest in infrastructure upgrade in order to bring its services closer to every Nigerian across the country. These two brands that understand positioning are leading the deepening of digital cultures in this period. Their collaboration is creating some very inspirational content that could really define the sports sponsorship field in our part of the world. With digital platforms and tools expanding the diversity of storytelling by the day, Joshua and Globacom have an opportunity to greatly shape the minds of the next generation. Both possess the knack to go the uncharted path and make more young people become digitally savvy content creators. As Globacom powers the AJ brand, it puts in place a platform for several young Nigerians to use the internet for good. It is not enough to be consumers of great content young Nigerians need to see these platforms as an opportunity to tell their own stories. You unpacked the commercial brilliantly, and the insights on Joshua’s journey to stardom make it even more inspirational.